Uff. Today we could see why is baseball amazing sport. Six innings was Rockies better team and walked for win. But in 7th made Chacin and defense any mistakes and Dbacks tied game at 4. This score withstood till end of 9th inning. In 10th started on the mound Rafa Betancourt but after twoo pitches he had to be changed by Lopez. It looked that he has injured left leg. We will wait for more informations. Wilton Lopez pitched well and didn´t allow any run. 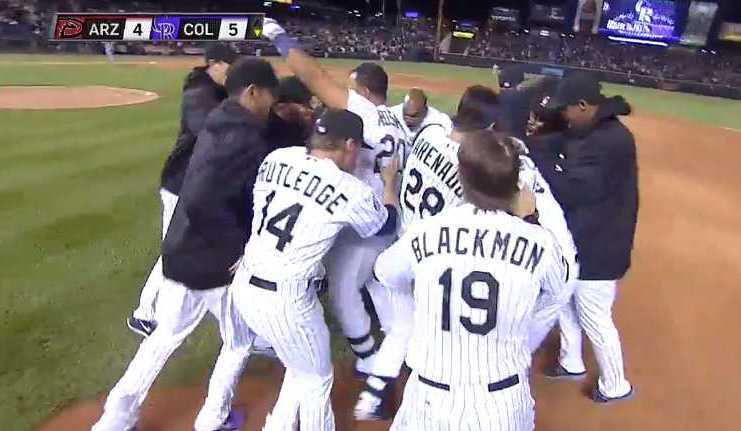 Rockies started 10th inning with Blackmon but he was struck out. CarGo played better and he had double. As excepted Tulo was intentionally walked. Responsibility was on Rosario. And he sent ball to right field and sent CarGo home. First walk-off hit for Rosario in his career.